MYRTLE RUST HAS ARRIVED IN VICTORIA! Myrtle Rust is the fungus Uredo rangelii. It has recently been found in Victoria for the first time and poses a threat to Victoria's nursery, forestry and beekeeping industries, as well as to public parks and gardens and native forests. It can potentially attack all species of the Myrtaceae plant family. Myrtle Rust is a native of tropical South America and was initially discovered in Australia near Gosford, NSW in April 2010. It has the ability to spread like wildfire as the spores can be transported by plant material, humans, animals, clothing, wind, water, equipment, vehicles etc. It has already established itself across coastal NSW, into Queensland and has recently been discovered at several sites around Melbourne. There is no known remedy to this problem. What does Myrtle Rust Look Like? Myrtle rust attacks young, soft, actively growing leaves, shoot tips and young stems, as well as fruits and flower parts of susceptible plants.The first signs of myrtle rust infection are tiny raised spots that are brown to grey, often with red-purple haloes. Up to 14 days after infection, the spots produce masses of distinctive yellow/orange spores.Severe rust disease in young trees may kill shoot tips, resulting in an overall decline in health of the host plant. To see examples of Myrtle Rust please click on the following link. "What does Myrtle Rust Look Like?" . What Plants does Myrtle Rust Affect? Myrtle rust has been found on over 150 Myrtaceae species. Orchids are not known to be directly affected at this stage, although Chiloglottis species are known to be susceptible to other rusts. However Myrtle Rust can be devestating to native orchid environments which could ultimately lead to habitat loss. How to Avoid Spreading the Disease. Do not touch, move or collect suspect plant material. Do not go to another site with any host materials. Decontaminate youself, clothes, vehicle and equipment. Contact DPI on the Exotic Plant Pest Hotline 1800-084-881 to notify them of the location. Do not send any suspect plant material to the Herbarium or Botanic Gardens for identification. ANOS Vic. 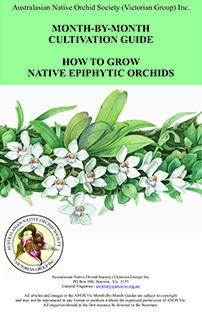 sells publications on Australasian Native Orchid Cultivation and other orchid related material. All merchandise is available to members and the general public. All proceeds go towards running the Society and helping to fund conservation projects. 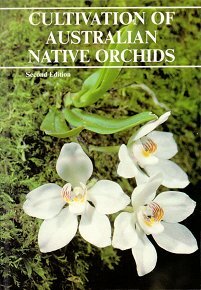 This 96 page publication contains valuable information for both the epiphyte and terrestrial grower of Australian orchids. The information is complemented by full colour pictures and diagrams. It covers topics such as, containers and mounts, potting and potting mixes, orchid houses, growing conditions, watering, fertilizing, propagation, pests and diseases, hybrids and orchid descriptions. This booklet covers what you need to do in the epiphyte orchid house each month of the year. The information complements the publication "Cultivation of Australian Native Orchids". 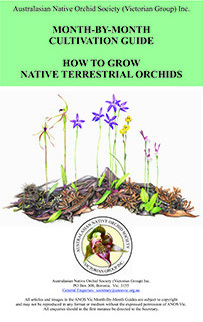 This booklet covers what you need to do in the terrestrial orchid house each month of the year. The information complements the publication "Cultivation of Australian Native Orchids". This is a new EBook publication on the wild orchids of the Australian State of Victoria and covers the 400 species of orchids currently recorded as occurring there. The work is 855 pages long (landscape format) and is illustrated with over 7,000 photo-graphs. Every species is featured with descriptive text and a distribution map and for almost all species there are multiple photographs showing whole plants, flowers and labellum details. This work represents the most comprehensive treatment of the rich temperate terrestrial orchid flora of Victoria (complemented by a small number of epiphytes) ever undertaken. This extensive work is published as an EBook - a PDF file with high quality photographs and featuring hundreds of links throughout the document to enable quick and easy navigation through the book. This EBook is available in two versions, either as a professionally produced DVD-ROM with pressed label in a crystal case with cover insert or on micro SD card which includes an SD adaptor so that the card will work in both a micro SD and SD card slot in your electronic device. 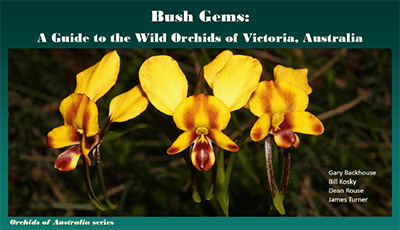 Download Bush Gems flyer . For more information and ordering details go to bushorchids. Price: A$25.00 including postage in Australia ($30 overseas). 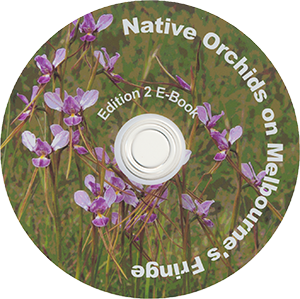 This magnificent CD is the second edition of 'Native Orchids on Melbourne's Fringe' which now covers all areas around Melbourne. It is a PDF document of 216 pages in landscape format, describing 138 terrestrial species and natural hybrids from this region, with over 600 photographs. All money raised from the sale of this CD will go to the ANOS Vic. Conservation Fund and the Australian Orchid Foundation. Proudly display your support for ANOS Victoria. Adorn your lapel, hat, backpackpack etc. and impress your friends at the same time. These solid metal badges display the society emblem Calochilus richiae. They come in Green and Gold with a sturdy metal clip and will last a lifetime. If you are interested in purchasing any of the above products please E-Mail your enquiry to Stan Harper.